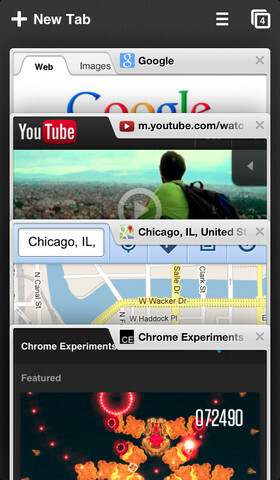 Google has updated the version of the Chrome browser for iOS devices. Now the version number for iOS devices has become v28. The new update makes it easier for iOS users to integrate the Apps with the new browser with just a sign in. Once you have signed into the Chrome, the users can move about the other Google Apps with a single click. You can also open the Google Maps directly if you like to follow directions in the Google Maps app instead of the browser. You can do so by changing the settings preference to open the links with Google Maps. This can also be done for other Google Apps like YouTube, Google+ and Google Drive Apps. The updated Chrome also features better voice search capabilities, text-to-speech for all variations in English, Spanish, German, Italian, French, Japanese and Korean languages. When using voice search you can use the tool bar controls. You can also view the browser in full screen on iOS devices and you can access the history from the menu. Plus the Google has also started rolling out its data compression service for Chrome to help users save bandwidth, load pages faster and browse more securely on their iOS device. The Chrome is also a lot stable now with lot of bug fixes. You can download the latest Chrome v28 from Apple Store here.